We spent more than three months researching all of the top-rated smart locks currently available and put 10 leading models through their paces in both side-by-side tests and real-world everyday use to find the best for your home. We have a best overall pick for most people, one with a keypad, an alternative for renters that works with your existing deadbolt, and a reliable (if unpolished) budget-friendly option. This post was done in partnership with Wirecutter, a buyer’s guide to the best technology. This is a condensed version of The Best Smart Lock; read the full review here. 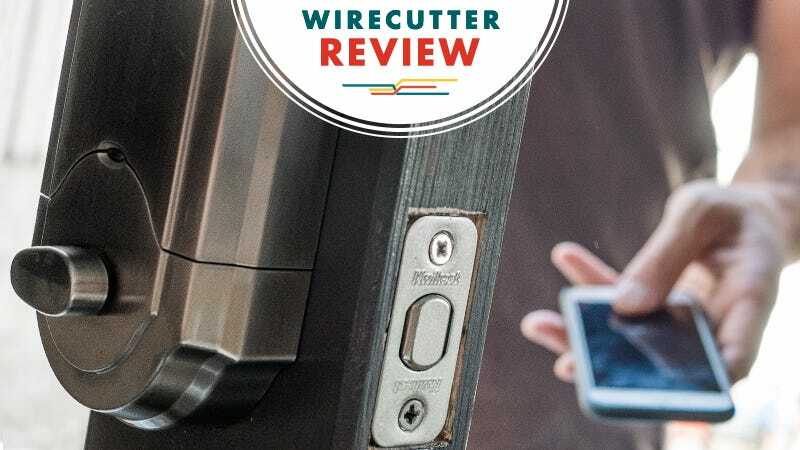 Smart locks provide a level of convenience and flexibility—not to mention a serious wow factor from being able to have your front door unlatch instantly at a finger’s touch. Letting the in-laws or the plumber inside without having to stash a key or arrange a meeting is also nice. And getting a notification on a smartphone when anyone comes and goes is both convenient and reassuring. Smart locks make sense not just for average homeowners, but for avid Airbnb hosts who have to deal with frequent key exchanges, as well as for small-business owners who want to keep tabs on who might be coming and going through their doors when they aren’t around. Our goal was to find a lock that offered the maximum amount of features while requiring as little setup and techie fiddling as possible. We restricted our selections to models that can be controlled and monitored remotely via a smartphone, whether or not that requires the use of a separate hub. With that in mind, we tested eight locks that came highly recommended by experts or by sites like CNET, Tom’s Guide, Digital Trends, and iLounge. We then set each of them up in a Brooklyn home and lived with them over a period of several weeks, judging them on ease of installation and usability of the app (where applicable) and performing mock entrances to get the hang of what it’s like to use them on a daily basis. The Kwikset Kevo with the optional Kevo Plus module is the best choice for most homeowners because it’s the most versatile lock we tested. It’s controllable via a standard key, a wireless key fob, or a smartphone both at close range and remotely over the Internet. It consistently had the fastest unlock/lock response times of all the locks we tested, and the mechanical whir of its moving parts was among the quietest (though its confirmation beeps were loud, but, mercifully, you can turn them off). The installation process is sufficiently simple enough for most anyone comfortable using a screwdriver and takes about 10 minutes; likewise, the companion app’s setup process is straightforward for anyone familiar with smartphones. The Kwikset Kevo does have a few minuses: Its housing is bulkier than some competitors’ housings (a problem that should be solved by the updated Kevo 2, based on the prototypes we’ve seen) and its convenience and versatility come with a higher price tag than budget options. But of all the locks we’ve researched or tested, the Kwikset Kevo with the optional Kevo Plus module is the most likely to satisfy those who want a convenient and streamlined way to enter and exit their abode. The Schlage Connect Touchscreen Deadbolt has even bulkier hardware than the Kwikset Kevo, and doesn’t have a dedicated app for remote control. (If you want to add smart features, you’ll need a compatible Z-Wave hub such as the Wink hub we used in testing.) For some people, though, it still may be a perfect solution because you can easily gain or share access to your home without ever needing to deal with a key (though it has a keyed tumbler as a dead-battery backup). The Schlage Connect’s resistive touchscreen is reliably fast, which is the real hook. Also, as an ANSI Grade 1 device, it’s sturdily built to withstand break-in attempts. And just in case anyone wants to test that proposition, it also has a few alarm modes built in, so someone trying to force your door will be greeted by a piercing siren. We also tested a near-identical Schlage model, the Sense, which differs only by being HomeKit-compatible. It’s also a nice option for anyone interested in a HomeKit-based system, though it currently lacks the ability to send notifications. Available in Apple stores everywhere and thus arguably the most high-profile smart lock around, the stylish August Smart Lock can be a good solution if you want to use an existing deadbolt; adding the August Connect Wi-Fi adapter lets you share access easily and keep tabs on who comes and goes from wherever you are. This lock makes a lot of sense if you’re a renter or own a vacation home, though we had a few quibbles: The battery compartment can slide off, and the auto-unlock feature was too unstable to be usable in urban environments, as it triggered a few times even when we were home. Another August add-on, the August Smart Keypad, which you can install outside the house next to your door, allows for easier, smartphone-free access sharing to guests. Once you figure in the keypad’s expense, though, you might be better off simply buying a keypad-equipped deadbolt such as our second-place pick, the Schlage Touchscreen Deadbolt. While we were testing, August announced a second-generation smart lock, but it wasn’t shipping yet. Its tweaked design should resolve our battery compartment issue andHomeKit certification is also on the way. The new design should be available this spring. For some people, the smartest lock may not be the smartest choice. The Morning Industry QF01SN Keypad and Remote Deadbolt has a physical keypad for typing in an access code, but it also comes with a keychain-fob remote. It’s got terrible remote access implementation via Z-Wave, but that’s forgivable at its low price. If you want keypad access but also love the idea of unlocking your front door from the car or not having to fumble with your keys while you bring in the groceries, this will do the job.